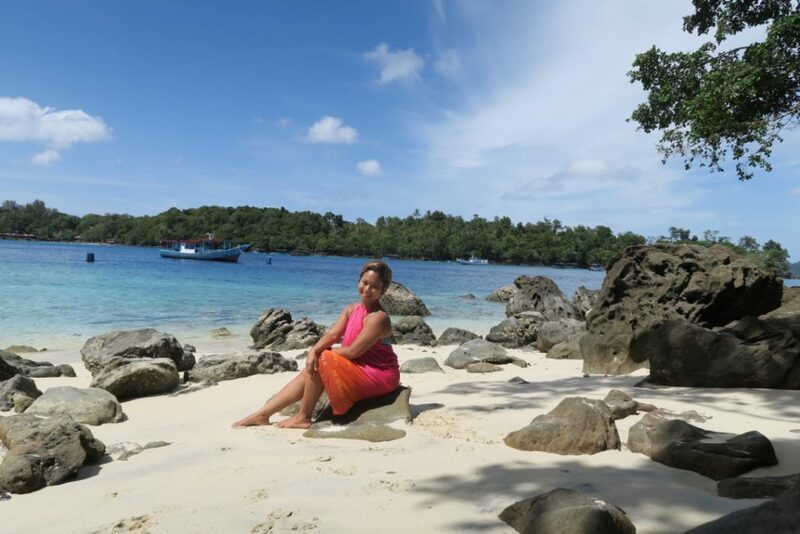 My short visit exploring Weh Island, Aceh was sweet but too short. Three days were not enough! 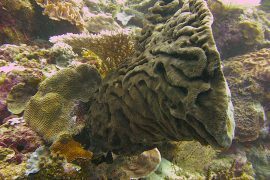 I wish to return to this most western point of Indonesia soon, and will definitely stay longer for some more diving :). The first day was basically “lost” for traveling from Jakarta, Aceh, then Weh Island. Even though I took the early flight at 6.30am from Jakarta, I still end up arriving on Weh Island at 5pm! The flight from Jakarta was only two and a half hours to Banda Aceh. The problem was… the boats going to Weh Island were not every hour. The fast boat was only available at 9am and 4pm. And the journey was 45 minutes. It was actually an easy trip, but long hours waiting in Banda Aceh could be tiring. I decided to spend a few hours hanging out in a coffee shop in Aceh, checked out some tsunami sites, and bought a traditional Acehnese sarong for my Mom. The fast boat from Banda Aceh to Weh Island was quite nice. It has AC and the ticket was quite cheap, only Rp 80,000. It was free seating. As I entered the boat, I asked the ticket guy, “Where’s the best seat?”. He said, “Second floor. All the way at the back (outside deck)” :D. I followed his recommendation. And I agreed. It was the best seat, because you could feel the sea breeze as you’re basically outdoor! So, if you normally got sea sick, you should definitely choose to sit in this area of the boat! I met with a group of local young people. Three girls and one gay dude. We chatted for a short while, the usual stuff, like “Where do you come from, how long will you be here for?”, etc. As the boat moved (on time! ), the gay dude said to me, “Hi Mbak… if you want to smoke, you can smoke here”. I replied, “Oh no, thank you”. He insisted, “You can smoke here. Seriously”. I said, “Thank you, but I don’t smoke”. He said, “Oh… you don’t smoke. I see. I thought you smoke, but you’re reluctant to do it. I just want to inform you that in Sabang (Weh Island), you’re free to smoke. It’s more chill there, unlike in Banda Aceh where people will stare at ladies if they smoke”. I smiled. Pretty surprised to know that people in Sabang were more relaxed and chilled that the ones in Banda Aceh :). The sea was a bit rough that day. Lucky that I chose to sit at the back of the boat. I kept looking at the horizon. Such a beautiful scenery! Blue ocean and some mountains surrounded it, and clear blue sky as the background. Forty five minutes later the boat landed in the harbor of Sabang, the capital of Weh Island. Pak Alfian, a guy who originally came from Medan but has been living in Sabang for many years, picked me up with Cici, the driver. They were kind enough to drop me off at Iboih Beach, the diving spot. 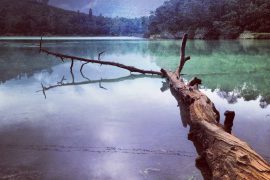 I have arranged to stay in Iboih for a night, because I wanted to dive the next day. The journey to Iboih from the harbor took around 40 minutes on a pretty smooth road. I noticed that there was no public transportation here. So, it was quite difficult for tourists who wanted to explore Sabang on their own, especially for backpackers since there was no public buses around. 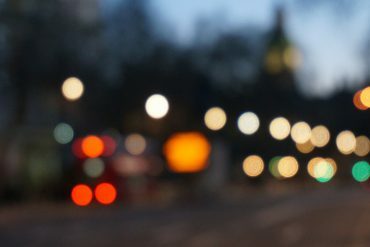 The only ways were to rent a bentor (becak motor – a rickshaw) or rent a car. 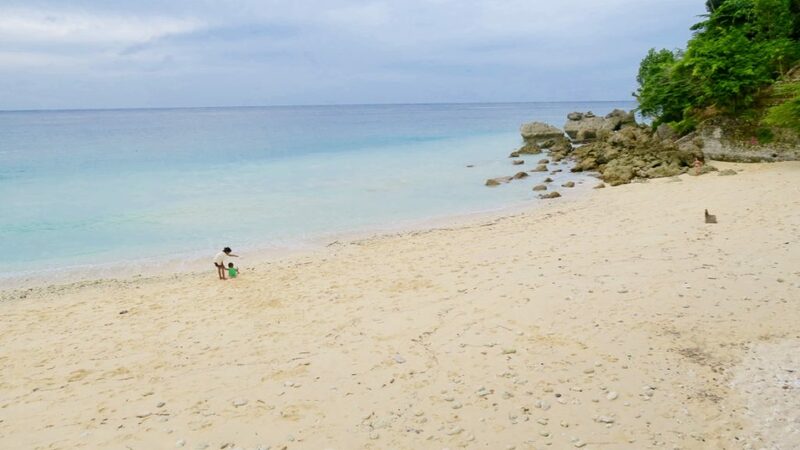 It’s considered as the most beautiful beach in Weh Island. When I reached Iboih, it was pretty quiet. Not many tourists. Apparently, that’s what happened during weekdays. But, Iboih would be full of people in the weekends. The locals also came here to relax with their family and loved ones. I have booked an accommodation with Rubiah Tirta Dive Center. When we reached Iboih, the car had to park in a “bigger road” and we had to walk to the hotel. At first I didn’t understand why did we have to walk? Couldn’t we just drive to the hotel? Apparently, everybody has to walk in Iboih. Because, there was no road. There was only a small and narrow path way for people to walk. And the path way was not smooth at all. You couldn’t really drag your suitcase. Also, it’s quite hilly, so you would walk up and down, with the forest on your left and beautiful ocean on your right. Quite interesting. Most of the hotels in Iboih were all modest. I didn’t see any five stars hotel here. Most “hotels” that I saw have bungalows or huts – on the cliff overlooking the sea. Simple accommodation. And cheap. Prices range from Rp 300,000 to Rp 500,000 for rooms with AC. The most expensive hotel was called Pulau Weh Resort. Once we reached the Rubiah Tirta Dive Center, I found out that there was no room for me! (yes, I already booked it two days ago!) 🙁 But I was so used to traveling to remote areas and things like this happened quite often, so it wasn’t a big deal to me anymore. In the end, everything would turn out just fine :). The guy at the dive center hooked me up at Fina Bungalow, which was located in the “center” of Iboih, which means… I had to walk back to the entrance of Iboih, near where we parked the car! God damnit. Fina Bungalow was not something I was expecting for. The room was quite spacious, but very basic. No hot water. No good view of the sea. At least it was clean. I didn’t mind since I knew I was only going to stay there for one night. I paid Rp 350,000 per night. There must be other better hotels here, but I couldn’t be bothered. I’ve had a long day already, woke up at 4.30am this morning and the least I wanted to do was dragging my suitcase around to look for a room to stay! 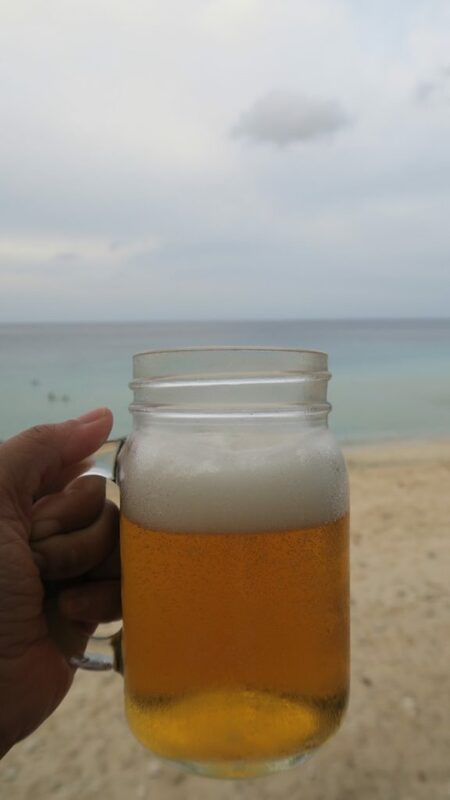 Drinking a beer by the beach would be perfect, after checking in the hotel. But hey, we’re in Aceh. Only few places had beers and alcohols here. People didn’t really drink alcohol. Instead, they drank LOTS of coffee. Coffee from Aceh was quite famous and Acehnese were all very proud of their coffee :). They could drink five glasses per day, or even more. Drinking coffee was part of the lifestyle here :). So, together with Pak Alfian and Cici, we decided to have a cup of coffee by the beach. Cici ordered an ice coffee and I was intrigued to try one, too. So, I ordered a glass of ice coffee with milk :). And it was a good idea. 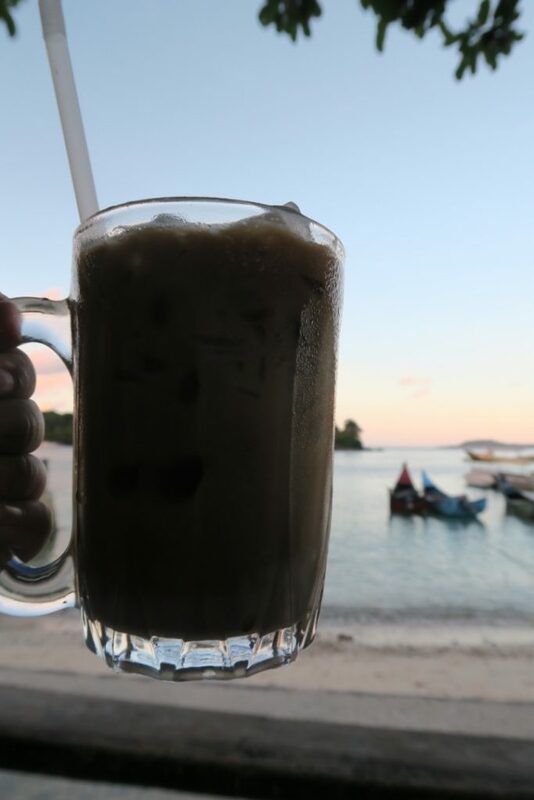 Drinking ice coffee by the beach during the sunset — definitely a good way to relax after a long day! Plus, the sea breeze was just soooo refreshing! I called the day after having dinner in one of the restaurants in front of the Fina Bungalow. Acehnese food was not vegetarian friendly at all. All dishes had either meat, chicken, or seafood. In the end, I had a plate of rice and an egg omelette :D.
Apart from Iboih Beach, another tourist destination on Weh Island is Gapang Beach. I stayed at Gapang Beach Resort for two nights. The resort was good in its old days, but now, it definitely needed some renovations. 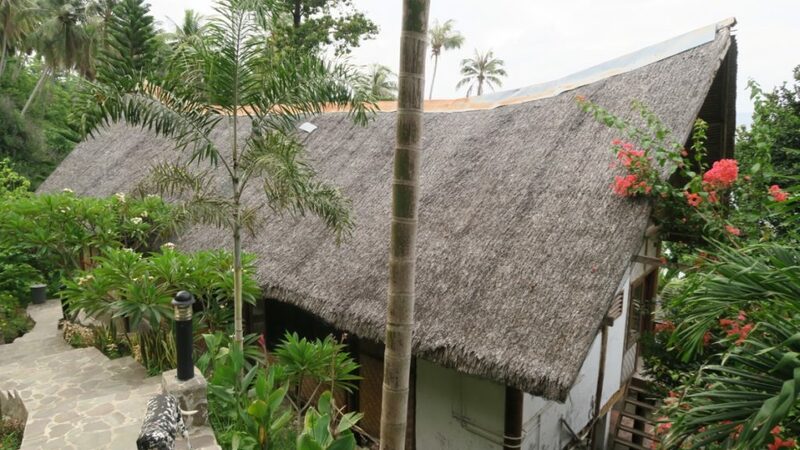 Nice wooden bungalows, traditional Aceh style. If they maintained it well, I was sure people would love it here. The bungalows were spacious. Each bungalow had a bedroom and a living room area, with a terrace and bathroom, too. Unfortunately, it was pretty old. All the furniture was outdated. The AC in my bedroom didn’t work, so I had to open all the windows to get some breeze — with a constant worry there would be snake or monitor lizard crawling into the room! No hot water, either. It’s really a pity, because this resort was located right by the beach in Gapang! Such a waste! 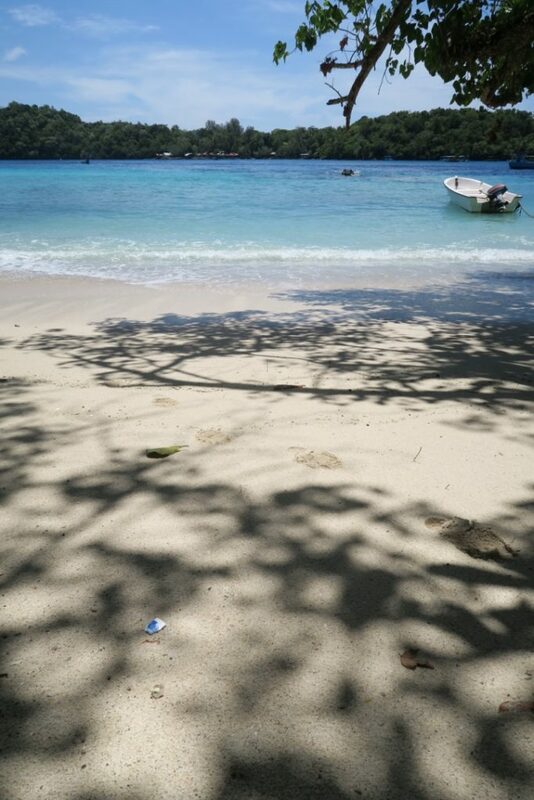 I loved Sumur Tiga for its loooong stretched beach. And you could swim here, too. The waves got bigger during the sunset, but you still could swim. How about snorkeling? I didn’t try snorkeling here, but people normally chose going to Iboih for snorkeling and scuba diving. So, most likely the corals in Sumur Tiga Beach not as nice as the ones in Iboih. However, I found a very nice accommodation here on Sumur Tiga Beach! Loved loved looooved this place! It was called the Casanemo Resort. Check out these photos. For a resort by the beach, Casanemo was super cheap! 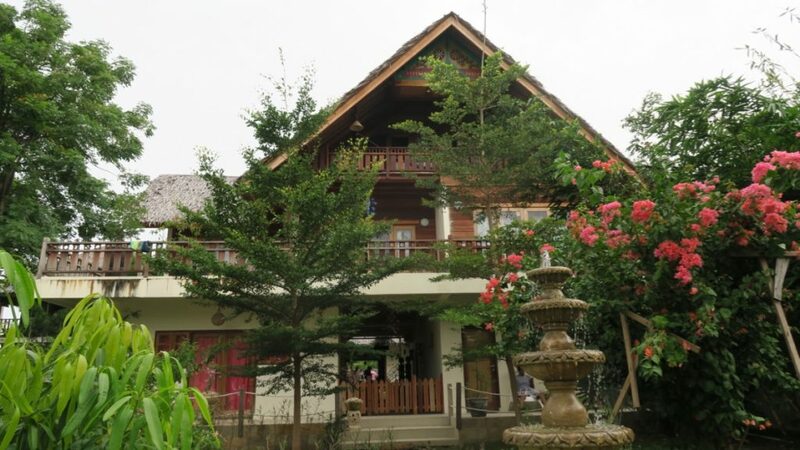 The bungalows were only Rp 450,000 per night! Could you believe it??! 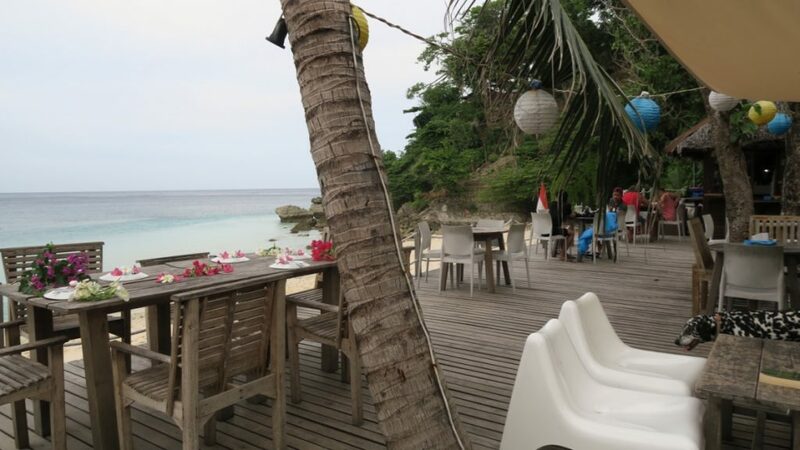 :0 Next time I go to Sabang, I would totally stay here! Exploring Weh Island in Aceh would not be complete without visiting the Kilometer 0. From Gapang Beach, it took me around 20 minutes by car on a zig zag road. What I loved from the journey was… the trees on the right and left sides of the road. They’re so beautiful! Big tall trees with its long roots and branches hanging – giving the image of a beautiful forest. I just couldn’t stop staring at those trees. And couldn’t stop being amazed. When I reached the monument of Kilometer 0, the site was being renovated. The local government constructed the whole area and planned to build a big tower here. The area looked quite messy, but didn’t stop me from striking a post on the monument, of course! LOL. The Kilometer 0 marked the border of Indonesia with the other countries, geographically. I stopped and looked at the ocean for a moment. I felt a bit emotional realizing that I was standing on the most western point of Indonesia. Here, at this spot. Kilometer 0. Finally :). This monument has a twin sister, which is located in Merauke, the most eastern point of Indonesia. Hopefully I could visit its twin sister, too, one day :). Weh Island is a jewel of the Western part of Indonesia. Tourists come here to relax on the beach. Scuba divers come here to dive and marvel the beauty of its underwater world. 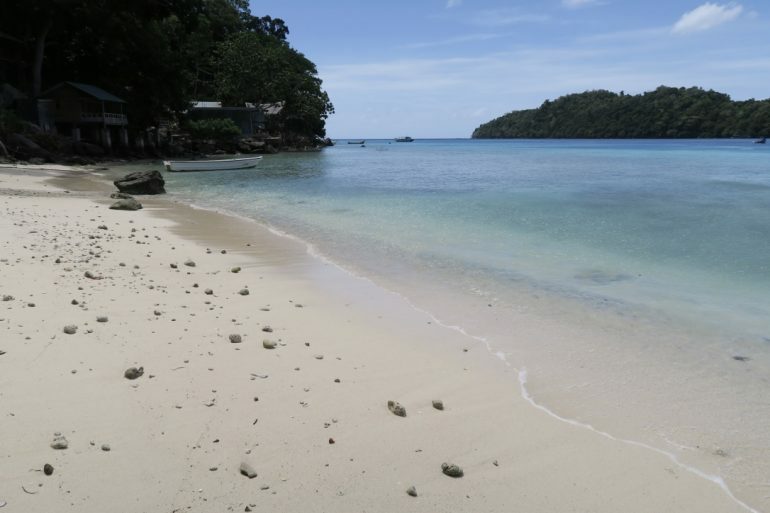 If you’re a scuba diver, try to spend at least 4 days of diving and two days to explore the island (or even more, if you just want to relax on the beach) 🙂 I’m sure, you’d have a relaxing holiday and feel refreshed afterwards! 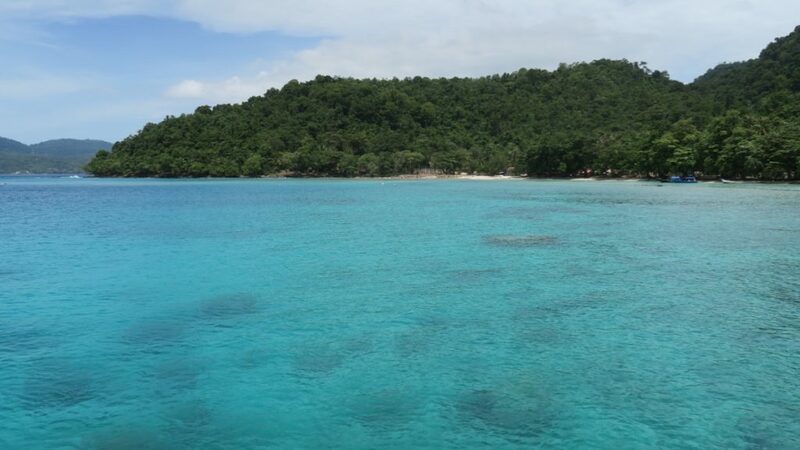 Enjoy Weh Island (Pulau Weh), guys!